From December 1 to 12th this month, the United Nations Framework Convention on Climate Change (UNFCCC) held its 20thsession of the Conference of its Parties (COP20) in Lima, Peru. Peru is said to be the third country most affected by climate change. It is the largest producer of gold in the region. According to the Office of Public Defender, an estimated 200 social conflicts happens every month, with most conflicts related to indigenous and peasant communities’ opposition to surface mining projects that are consistently contaminating their water sources. 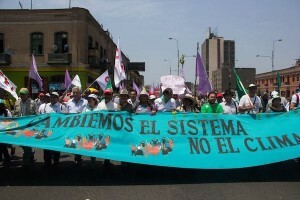 On December 10, an estimated 15,000 people marched for over three hours in Lima for the March in Defense of Mother Earth in Lima. But the march had already started a week before, on December 3, in Cajamarca, a city in the northern part of Peru. The group from Cajamarca arrived in Lima on December 9th, the largest marching contingent to join the national March in Defense of Mother Earth. From December 8 to 11, the People’s Summit on Climate Change hosted an alternative forum that demands that climate justice should be reflected in international and national policies. Grassroots organizations and networks from all over the world presented community-based perspectives and realities of their impact of climate change. This session included Claudia Caori, an indigenous Quechua Congresswoman from Puno, who has the Vice-president seat on the Agrarian Commission in Congress; Wilder Guevara, representative of the Youth Association of Cajamarca, and Rosario Morales, an indigenous journalist and national coordinator of Watershed Committee of Jequetepec. There is a demand for a territorial and land use national policy, particularly due to the abuse of Conga mining project using water from the 284 natural water reserves (lakes) of the highlands of Cajamarca. A major challenge has been the recently approved law known as “Ley Paquetazo”, or in legal terms “Law 30230,” which decouples environmental protection from economic growth. There are serious concerns that this new law severely weakens the ability of environmental bodies in Peru to regulate and supervise economic activity, like power and infrastructure development, that impacts the environment. This law will undermine the Ministry of Environment and its regulatory ability to determine the levels of contaminants permitted for a healthy environment, which zones can be designated untouchable to business, or to demand a detailed environmental impact assessment before an extractive industry enters a territory. The law essentially will make it more difficult for Peru to take effective and adequate climate action in the interests to protect national, social and environmental issues.